Von Trotha-Firestien Farm is located in the settlement of Bracewell, northwest of the City of Greeley in rural Weld County in the state of Colorado. It lies one half mile north of the Cache la Poudre River in the Poudre Vally as formed by the bluffs to the south. An unobstructed view to the west of the property is of the twin peaks of Longs Peak and Mount Meeker with the remaining 40 acres of farmland in the foreground. View to the west across the hay field. On March 5, 1874, Edward T. Nichols received a land patent for the south half of the southeast quarter of Section 30 (Township 6 North, Range 66 West). Denver Pacific Railway Company gained title to the north half of the northeast quarter of Section 31 (Township 6 North, Range 66 West) by patent deed on April 24, 1875. Wiley Jones received a patent deed to the southeast quarter of the northeast quarter of Section 31 on September 20, 1870. The portion of this land lying north of the Cache la Poudre river later became part of the Von Trotha-Firestien property. In 1874, William R. Jones received a land patent deed to the southwest quarter of the northeast quarter of Section 31. The portion of land lying north of the river in this deed also became part of the Von Trotha-Firestien property. These four portions of land made up the original boundary of the Von Trotha-Firestien farm property. In 1903, eight acres were sold to Wilson Henderson. In 1996, approximately 120 acres were sold to a local gravel mining company. After mining was complete, this property was donated, in 2017, to the Poudre Learning Center Foundation. Fifty acres now remain as the historic district of the Von Trotha-Firestien Farm at Bracewell. 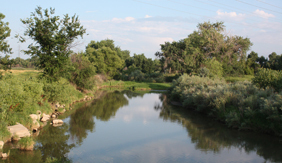 A portion of the pasture of the farm is located within the flood plain of the Cache la Poudre River. This places part of the farm within the Cache la Poudre River National Heritage Area. This heritage area commemorates the contributions of the River to the development of water law in the Western United States, the evolution of water delivery systems, and the shaping of the region’s cultural heritage.